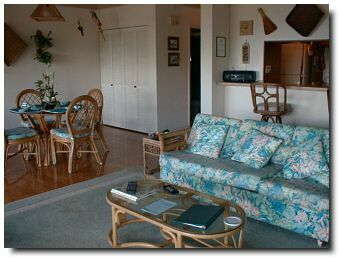 Molokai, Hawaii - Condominium accommodations on The Friendly Island. rise hotels, no traffic and no crowds. A half-hour from Honolulu or Maui on one of several regularly scheduled flights each day, Moloka'i is what most people dream of as an authentic tropical retreat. Swimming, surfing, snorkeling, scuba diving, fishing, ocean kayaking, golf, sightseeing, horseback riding, mountain biking, road biking, wilderness hiking, mule trips, and loafing. 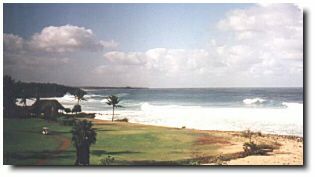 Paniolo Hale is a quiet, low-density, ocean-side complex of townhouses surrounded by the championship golf course of the Kaluakoi Resort and is just steps from the warm sands of Kepuhi Beach. Located on the sunny west end of the island, it features Hawaiian plantation architecture, landscaped grounds, and a swimming pool. 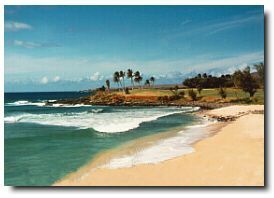 The nearby Kaluakoi Hotel has small shops which offer resort clothing and sundries. It's a ten-minute drive to Maunaloa, a quaint Hawaiian town where there's a grocery store, post office, multi-screen movie theater, excellent restaurant, and the activities center for Molokai Ranch.